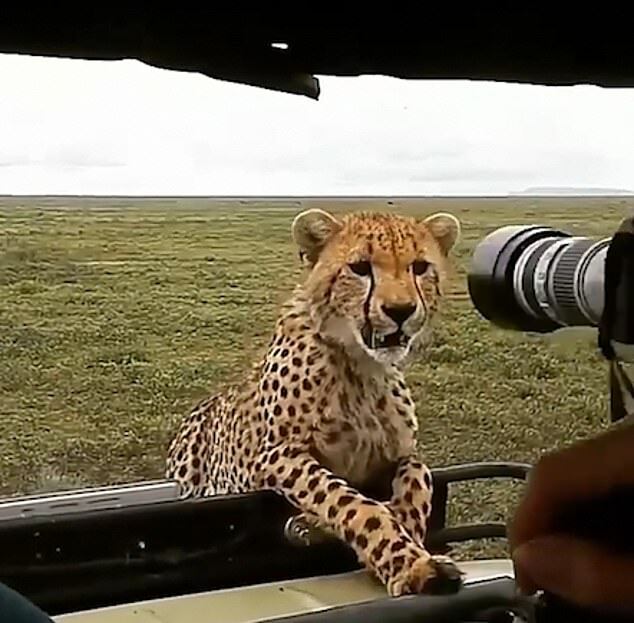 A photographer who was filmed ‘shooing’ and swiping at a curious cheetah who climbed aboard his tourist jeep has been slammed online. 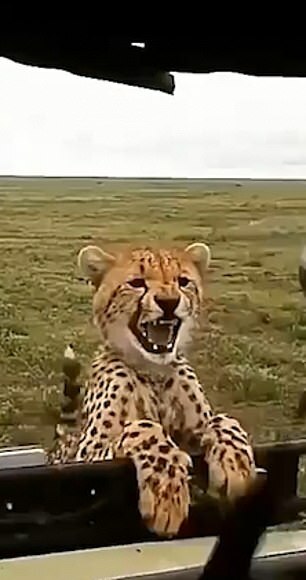 The video, which was uploaded to the Wonders of Africa Instagram page, showed two cheetahs poking their heads above the side of the vehicle – before the unidentified man began thrusting his camera at them. 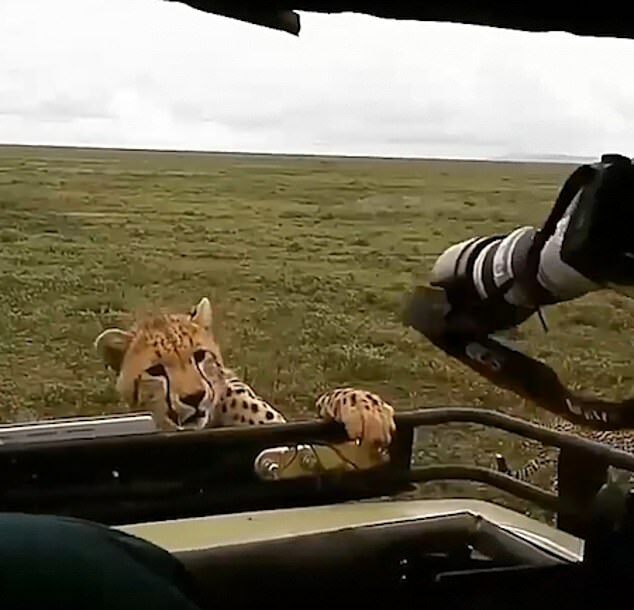 The confused animals ducked back before snarling at the man, who continued to flap at the cheetah. The incident continued for several seconds before a guide eventually turned the engine on and the big cats slowly backed off. On social media, the photographer, guide and driver were all roundly criticised for their handling of the situation. 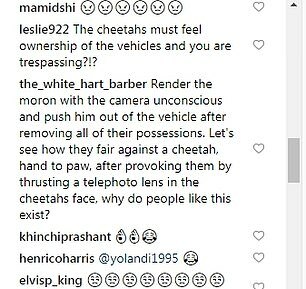 One Instagram user said: ‘Render the moron with the camera unconscious and push him out of the vehicle after removing all of their possessions. 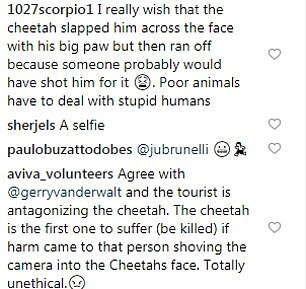 ‘Let’s see how they fair against a cheetah, hand to paw, after provoking them by thrusting a telephoto lens in the cheetahs face, why do people like this exist? Another said: ‘Oh, sure. 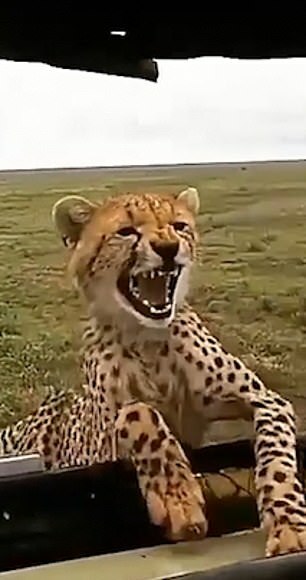 Antagonize the cheetah. That will end well. The guide should be reported for letting this get this far – to the point they are almost getting in the top of the car. And another said: ‘You’re lucky the cheetah didn’t react to your ‘shoo’. I think the horn would have been a good idea or making sharp high pitch noise.